So is my spirit still. My will within Thy will. O Fortune, idle pedlar, pass me by. O Death, keep far from me who cannot die. So do I rest in Thee. It is mine hour. Let none set foot therein. It is mine hour unflawed of pain or sin. Is all the changing dream of Thee and Me. A love that consumes and quickens; a soul-transfiguring fire. My life is possessed and mastered: my heart is inspired and filled. All other visions have faded: all other voices are stilled. They vanish like breaking bubbles, those old soul-torturing themes. I cannot guess them or solve them, but I know that they are not there. For lifes inscrutable meaning is clear as the dawn of day. There in the speaking stillness; there in the rose-flushed snow. I feel what has neer been spoken: I know what has neer been guessed. They mingle and melt as I watch them; melt and mingle and die. The land is one with the water: the earth is one with the sky. I breathe the breath of the morning. I am one with the one World-Soul. I live my own life no longer, but the life of the living Whole. I am more than self: I am selfless: I am more than self: I am I.
I have found the springs of my being in the flush of the eastern sky. I have found the flame of my being in the morns ambrosial breath. But I find it renewed, rekindled, in the life of the One, the All. I look not forward or backward: the abysses of time are nought. From pole to pole of the heavens I pass in a flash of thought. The pulse of measureless motion, the pulse of fathomless rest. Is it motion or rest that thrills me? Is it lightning or moonlit peace? Am I freer than waves of ether, or prisoned beyond release? The world-wide river is streaming, the river of life and love. I may not measure its windings, but I know that its aim is sure. Its strength is builded of weakness: its right is woven of wrong. From the sacred springs of Creation to the ocean of love Divine. I hope, I believe no longer: I am lost in a dream of love. Laid bare their blue abyss. And to one Center draws. But lead if by dim blood-stained steps to Rest. And it was boundless Love. That Beauty of the King which dawns upon the seers enraptured eyes. With Gods foreknowledge in the clouds of Heaven. But something precious which I feared to lose. -How shall I show it, but by parables? Will find a richer harvest waiting him. Is given thee to suffer for Gods sake. Canst thou not suffer then one hour,-or two? Would overcome thee? Thou wouldst say, So soon? More patiently;-I have not yet praised God. And He might answer to thee,-Never more. Waiting on Gods hand, not forestalling it. Is easy to be turned by mortal hands. Are all for His hand only to bestow. Receive thy portion, and be satisfied. The more partaker of the Cross of Christ. Wilt thou refuse? Nay, not for Paradise! Thee, soul and body to thy living Lord! That waits to prove thee to the uttermost. If thou couldst see His face;-but in the dark! That is the one last trial:-be it so. How couldst thou suffer but in seeming, else? Endure, endure,-be faithful to the end! As now they compass me. As ours, oer many a tear! 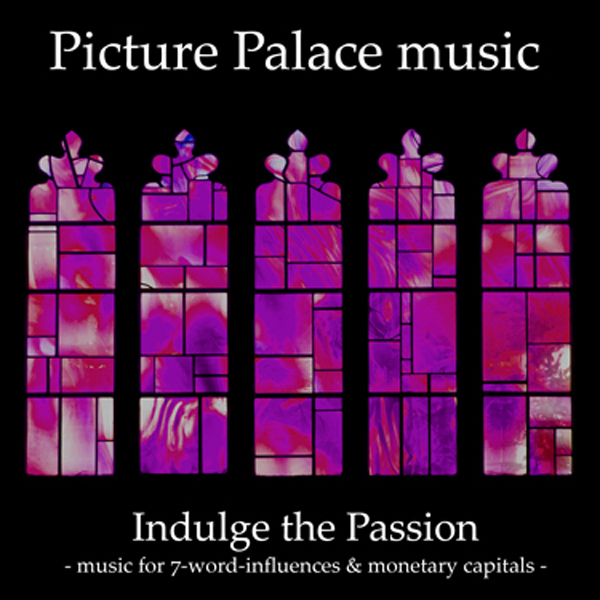 Picture Palace Music (PPM) is a band around Thorsten Quaeschning (“Q”). Thorsten has been keyboardplayer in Tangerine Dream since 2005 and co-composer of albums “Springtime In Nagasaki”, “Madcap’s Flaming Duty” and Jeanne D’Arc”. The main idea of the group is to reproduce the musical dynamic and experiments of old live accompaniment for silent movies and to give them a modern soundtrack with nowadays technical options. This shows that the old silent movies are not moldy: they are timeless and fascinating! The music is inspired by more than eighty years old silent movies. Now, Quaeschning and his many musical friends (live, the band is sometimes expanded up to ten men, amongst them four guitarplayers and three drummers!) have created “Indulge The Passion”. The subtitle is “Music for 7-word-influences & monetary capitals”. Again, Thorsten’s main contributor is synthesist Sascha Beator, who had (co-)written many of the songs on the album. The music on the album is based on famous poetry. The music of PPM is often called “hard”. Maybe it is better to call it a more progressive or rockversion of Tangerine Dream. This can already be heard on the openingtrack “Immortal Hours And Passion Flowers” that clearly could have come from one of the recent records of TD because of the thrusting drums and melodically tunes. Talking about TD: “The Rose And The Cross”, with it’s classical themes, could have been filmmusic. This is something TD has specialized in for many years (that was before Thorsten joined). “Seperate Existence” has Oscar Wilde’s “Humaniad” as a source of inspiration. “Speaking Stillness In The Rose-Flushed-Snow” has a really excellent main melody. If TD had used the track, this could be one of the highlights of their recent career. In the romantic “Beatific Vision” the melancholically sounds of the Memotron have a prominent place. “Fiery Fountain Of The Stars”, again, is almost symphonic rock. In “Passion Of Regret” Thorsten plays a sound that has traces of an accordion. This proves the versatility of PPM. “Continuous Aspiration” is powering electronic rock. PPM creates the perfect mixture between electronic music and rock. Electronic rock, so to say. Fans of the “rocky” side of Tangerine Dream would love it but it is also highly recommendable to lovers of progressive rock. In its quest for an absolute originality Picture Palace Music stigmatizes our incredulity by works of a surprising sensitivity beats up by furious surge of violence. Ambiguity? Completely! Indulge the Passion is a perplexed work which leaves a strange imprint of fascination after the first listening. And, according to the numerous instruments listed for its making, every additional listening dissipates the doubt and roots the perception that we are in front of a great and surprising work with ambivalent structures, if not schizophrenic, where the sweetness is next to violence and the romance get lost in its reflection. Indulge the Passion is another wonderful work which will survive to this fascinating group which is weaved in the meanders of a world of black and white and which makes me say that Picture Palace Music matures like souls in turmoil. Lugubrious synth waves and other ones glimmering overlap to pave the way to the sober percussions of “Immortal Hours and Passion Flowers” which open the timid rhythm of Indulge the Passion. Blades of synth cry over this introductory tempo to which are adding some percussions which resound as some hollow wood, leading this rhythm towards a heavy and resounding bass line. And this rhythm grows heavy. Circumspect it collapses under these heavy bass notes and these percussions which ring as glass wood, keeping a melodic approach that synth laments are wrapping of an intriguing aura of mystery. Keyboard chords draw a fine harmony which fades in this maze of percussions while “Immortal Hours and Passion Flowers” goes into a brief atmospheric passage where crystalline arpeggios and silk choirs are floating in a black hole that some fine percussions redirects towards its heavy tempo of origin. Ambiguity? Absolutely! The 9 titles which feed the indomitability of Indulge the Passion offer superb structures where the passion is devoured at knocks of turmoil with rhythms and melodies which bicker in ambiances sometimes hard rock and sometimes oniric. As a rose growing in the garden of darkness, “The Rose and the Cross” is a pure jewel of sensitivity. It’s a wonderful moment which tears the soul with its strings of violins and cellos crying over sequences / percussions running as wavelets caught in dead water. The rhythm is slow, even statics, with percussions in the Amerindian clanic forms which collect its tears of violins / cellos of which the parameters of sensitivity increase in a latent crescendo structured to tear away tears of the heart. Outstanding and too heart-rending! “Separate Existence” shakes our emotional torpor with strikes of percussions rolling in an infernal spiral. The percussions fall very hard on a tempo of which the harsh and unbridled rotations drag harmonious chords and supernatural breaths. These voices get lost in synths and guitars which un ite their lamentations to form some enthralling melodies both spectral and virginal. In its rhythmic pattern which seems to climb an eternal slope, “Speaking Stillness in the Rose-Flushed-Snow” grave in our ears with its heavy percussions and its flickering sequences. It’s a fascinating and lively electronic ballad to miles tones lying on a bubbling bed of sequences and percussions which shape a heavy but harmonious rhythm eroded by guitars, synth and kazzoo electric which unite their stamps to weave some superhuman laments. It’s the white and the black put in music. “Bealific Vision” is another great melody. It’s a real pearl of tenderness and melancholy with guitars which roar on the back of the fragility of a piano of which the notes embroider the memoirs of a delicate contemplative melody which cries in the fog. Arpeggios waddling with innocence draw the charming introductory melody of “Fiery Fountain of the Stars” which collapses in a furious whirlwind activated by a good bass line, syncopated sequences and strong percussions. Heavy and edgy, as melodious and ethereal, “Fiery Fountain of the Stars” navigates between tranquility and fury with a surprising resemblance with Tangerine Dream. The somber and lugubrious breezes of the Harmophone introduce the solemn intro of “Passion of Regret” which stumbles and melts into a suave and slow tempo to the scents of Pink Floyd on US and Them. The synth blows its airs of romances of a dark sensuality on a bed of sparkling arpeggios which glitter such as droplets in suspension. The more we move forward and the more it becomes heavy. And, a little after the 6th minute, the percussions fall. They accelerate an evanescent rhythmic which unfolds its wrath with heavy soloing riffs and tremulous sequences before disappearing just like that into floating ambiences where some fragile piano notes roam in abysses filled by protesting spirits whom will be swept by a furious apocalyptic ride. “Compass Me” is another wonderful title. Its intro is swept by the winds of a didgeridoo which blow in a plain filled by a ghostly aura of spectres from deserts. Notes of an acoustic guitar are strolling there, looking for a melody to be lived within, whereas the percussions pierce the horizon to mold a mesmerizing dramatic approach. And it’s through these percussions, this guitar carried by the ochred winds of a didge and the wandering breaths of lost souls that “Compass Me” espouses the fascinating crescendo of a heavy but floating rhythm, like a slow ride in hostile lands where the sands are glittering such as some bubbles bursting under a blazing sun. Chords of an electric piano roam in the grooves of their resonances, displaying the somber comfort of “Continuous Aspiration” which breathes by knocks of cymbals. A sequence emerges. Its keys flicker eagerly, dragging the cymbals in this spasmodic linear dance towards the heavy knockings of a drum which hammers the heavy and incisive rhythm of “Continuous Aspiration”. And a feminine voice roars its sensuality on a rhythm of lead, concluding another intense musical journey in the theatrical entrails of a beast to multiple artistic resources. It’s in the broth of pure black and heavy electronic rock that Indulge the Passion assails our senses. Once again the gang of Thorsten “Q” Quaeschning disconcerts with a powerful album to the antipodes of a passion eaten up by remorses. Violent and soft, romantic and prosaic; the universe of Indulge the Passion navigates in full storm, caressing our fantasies and ignoring their rules to sink into the most absolute black. It’s a puzzling and fascinating opus which is in the lineage of Picture Palace Music’s big works; by far the most creative band that has emerged in the last decade.